This big guy is is 2 year old and ready for his forever home. 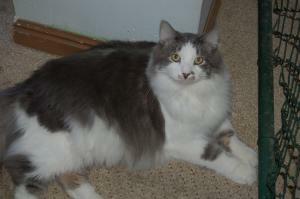 His adoption fee includes his neuter, current vaccinations, and deworming. He is a GIANT love bug. He is great with dogs, and other cats. He is a bib big boy with tons of love to give. This entry was posted in Adult, Cat, Cats, Dogs, Domestic Long Hair, Extra Large, Housetrained, Male, Young Children and tagged House trained, Spayed/Neutered, Up-to-date with routine shots. Bookmark the permalink.